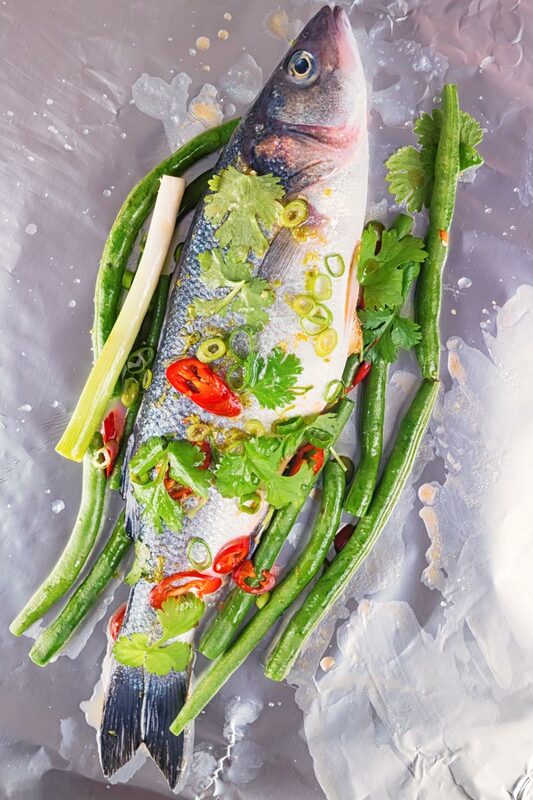 This Asian Fish En Papillote features a classic French technique with bright and vibrant Asian flavours, you cannot beat a whole sea bass cooked on the bone. 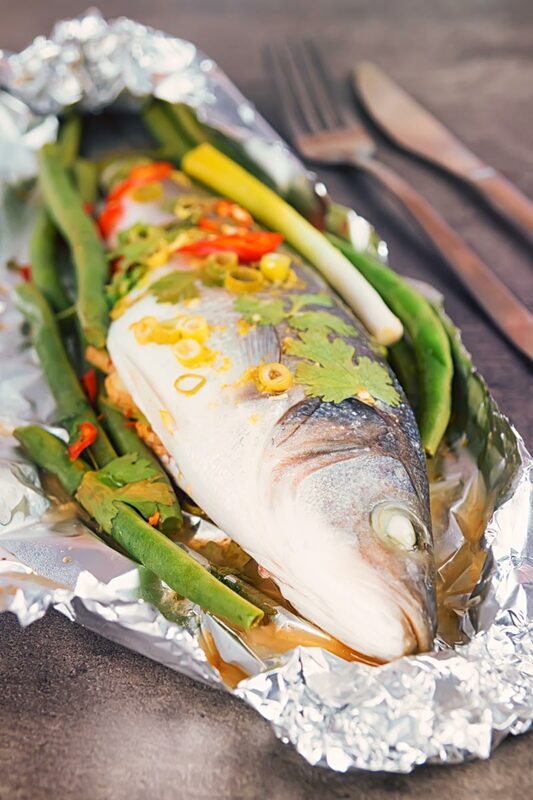 Asian Fish En Papillote (Sea Bass). This Asian Fish En Papillote recipe uses a fresh whole sea bass with great vibrant Asian flavours. It comes hot on the back of a whole tandoori fish recipe that used very different Asian flavours. Cooking en papillote may sound fancy but it essentially is nowt more than cooking in a ‘bag’. It is often thought of as a classic French cooking technique but dates back over 4,000 years and earliest records have it rooted in India. Originally there would have been no tinfoil of course, with leaves being used. It is actually a technique still practiced today throughout Asia. However, banana leaves are not all that easy to lay your hands on in these parts as you may imagine. Either way, it is a beautiful way of cooking fish the parcel seals in all of the steams, juices and flavours. 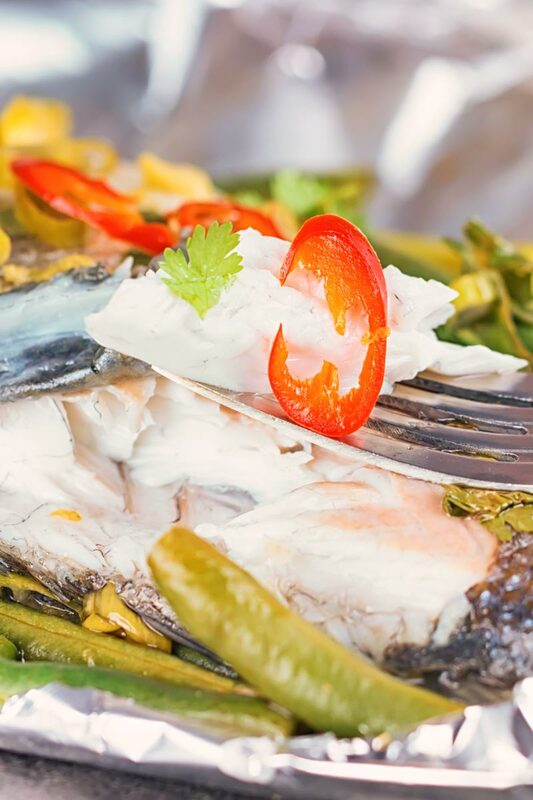 As a result, the fish cooks much more gently than traditionally baked or grilled fish. How To Cook En Papillote. For some strange reason, lots of folk worry about eating food with eyes… I have no idea why, if you eat meat or fish they all had eyes at some point in time or other. There is a true majesty in serving a whole fish that I think cannot be beaten. 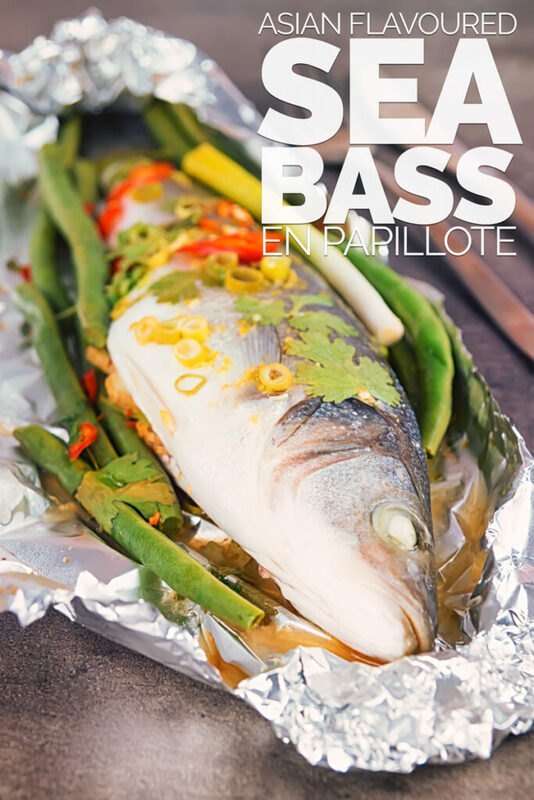 Particularly in this fish en papillote. There is a drama and a sense of magic as you unwrap your own little parcel. Don’t get me started on the aroma that has been trapped in that parcel as it slowly roasts and steams. The secret is to ensure that the parcels are tightly sealed so that none of the steam can escape. But do not tightly wrap around your fish, you want to make a tent that allows the flavour and steam to do its magic. After that, it is a simple case of chucking it in the oven and letting it do its ‘thing’. You could even cook this on the BBQ if you wanted to like this grilled trout recipe. Just chuck the parcels over some indirect heat and cook for 20-25 minutes. In the relatively short time I have been running my website the availability of fresh sea fish in Hungary has changed dramatically. This sea bass recipe is the first time I have seen sea bass here in Hungary. 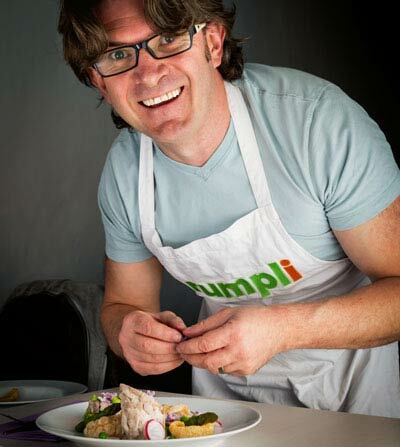 Cooking with seafood and fish in the UK was one of the things that got me hooked on cooking. 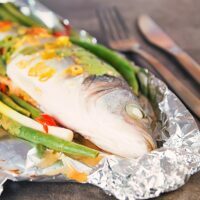 So seeing sea bass in stores means that recipes like this fish en papillote, my pan-fried cod recipe or blow torched mackerel recipe will be a more common feature as time progresses. You may even hear me squeal with excitement no matter where you are if I ever find fresh mussels! If your friend fishmonger has not cleaned the fish for you, scale and gut the fish. Slice the garlic and chili and cut the ginger into coins approximately 2-3mm thick. Top and tail your green beans. Zest the lime and then cut the lime in half. Finely slice the green parts of the spring onions and leave the white part whole. Place a single seabass diagonally on the baking parchment and season with salt inside and out. Then arrange half the green beans, add the white part of the spring onion, half of the chili. The season with half of the lime zest, lime juice, sesame oil and rice wine. Wrap to form a parcel, you do not want to wrap the foil around the fish. You want to create a tent but sealed well enough to prevent the steam from escaping. Repeat with the second fish. Bake in the oven at 180°C or 350°F for 25 minutes. Serve at the table allowing people to open their own parcels, the smell is insanely good! Cooking the whole fish always seems so intimidating but you have made it look simple and easy. Can’t wait to tackle this one. It really is very simple and in many ways easier than cooking fillets of fish as the ‘bulk’ help protect against over cooking. I love the flavors you’re using here. I’m lucky that I have access to all the banana leaves I want! Not sure why I’ve never used them before. Great recipe! I love fish cooked in papillote and I am not worried about the eyes, at all. Actually, the cheeks are delicious. The first time I cooked a trout in a parcel for my Irish husband he was amazed I was sealing the parchment paper with a stapler. LOL I never used Asian flavors so I will try your recipe for a change. Sounds nice and fresh. Plenty of sea bass here in Italy (on vacation). Envious yet? I love simple fish dishes like this, they really let the fish shine. This one looks so fresh and delicious! Me too, it certainly ticks the simple but tasty box. What a great way to cook fish. So simple and a lovely light summer dish.